In the Community | Abbotsford Chrysler Abbotsford Dealer BC. We here at Abbotsford Chrysler are very fortunate to be part of a close-knit and diverse community in the Fraser Valley Area in British Columbia. Whenever we can, we strive to enrich our community by getting involved with our local neighbours. A few ways we give back is by assisting our local youth as well as Canadian athletes through programs, donations or sponsorships. We are very proud to be a part of our Abbotsford community. Here are some ways our team is involved in our very own backyard. This year Santa made a special trip to Abbotsford Chrysler to put some big smiles on some deserving faces. We always look forward to having Matthew’s House and their kids in our dealership especially at this time of year. Nothing warms our hearts more than seeing a child’s face light up when Santa makes an appearance. It’s often forgotten in many communities that children don’t get enough nutrition before facing a full day of learning. Most times, unnourished children have a hard time focusing on different tasks and have lower self- esteem. We want to make sure that we’re doing what we can in order to make a difference in the matter. Every Tuesday, a volunteer from our team goes out to Jackson Elementary to help feed the school’s 170 students. The Cyrus Centre is a non-profit organization based in Abbotsford and Chilliwack which responds to community needs for youth from ages 13-18. Its purpose is to create a non-threatening, non-judgemental and supportive environment for troubled youth. On the holiday season of 2016, our team put together and donated 20 back packs filled with clean clothes, as well as winter necessities to somehow brighten their holidays. Another way we love giving back is by assisting our local Canadian athletes through sponsorships and support. We’re so proud of our athletes, and want to give them the ability to drive around in style. Seeing as it can be difficult to make time and find access to a vehicle during training, we are more than thrilled to be able to provide a vehicle for them. Meet the athletes we are proud to call a part of the Abbotsford Chrysler family. 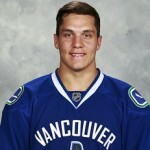 Bo Horvat plays as a centre for the Vancouver Canucks and sports the number 53. He was selected 9th overall in the 2013 NHL Entry draft. Bo is currently driving a 2016 Jeep Grand Cherokee Overland. Learn more about our sponsorship with Bo here. 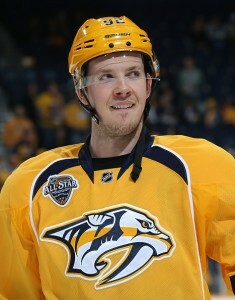 Ryan Johansen is currently playing for the Nashville Predators as a centre. Ryan is originally from BC and started his hockey career by playing minor hockey in the Greater Vancouver area before moving up the ranks. He was signed to the Columbus Blue Jackets in 2010 at the age of 17. We are overjoyed whenever Ryan is able to visit and meet fans at Abbotsford Chrysler. 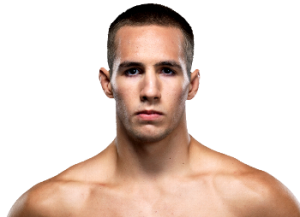 Rory Macdonald is a renowned UFC fighter fighting in the welterweight division. Originally from BC, he is a former King of the Cage Lightweight Champion and is ranked as one of the top UFC fighters globally. We are thrilled Rory is a part of the Abbotsford Chrysler team and driving a Ram 1500 truck.